I’m appalled that The Donald might actually win the Republican nomination running on a “platform” of bombast and xenophobia. But like many of you, I’ve also been trying to understand his appeal. A booming cottage industry—shall we call it Trumpology?—is emerging to explain his supporters to the rest of us. Is it the strength that he projects? His image as a “winner”? Is he tapping the anger of the white working class and finally showing them some respect? Or is a significant slice of America still simply, and secretly, racist? In the professional conservative world, “political correctness” is confined to the Left. But for Trump’s supporters, who are less doctrinaire, it means something broader. It refers to the things that elites won’t admit but “ordinary people” (or at least the “ordinary people” who like Trump) know are true. Liberal elites may try to conceal some of these “truths”: Mexican immigrants are wrecking the country; Muslim immigrants are potential terrorists. But conservative elites conceal others: Trade deals destroy American jobs; big donations affect government policy. Our world of education policy is full of examples of this kind of political correctness. “Ordinary people” understand that some kids are smarter than others, that some parents are completely out to lunch, that some teachers are burned-out dolts. But we can’t actually admit that in polite company. But what’s the biggest taboo in education today, especially in higher education policy, that anyone on the street will tell you? It’s that lots of high school graduates aren’t ready for college, have virtually no shot at succeeding there, and are better off doing something else with their time. And why shouldn’t high school graduation standards be set at a college readiness level? Because we’re not going to deny diplomas to a majority of America’s eighteen-year-olds. That’s what would happen, at least for the foreseeable future. As data from the National Assessment of Educational Progress show, we’ve never gotten more than 40 percent of twelfth graders to the college-prepared level. 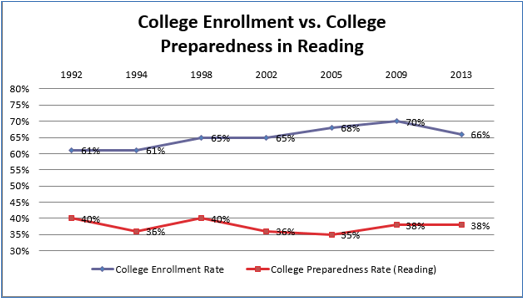 What this picture shows is that the “college preparation gap” is larger now than in 1992, even though the college preparedness rate has remained relatively flat, due to the fact that the proportion of recent high school graduates enrolling in college rose sharply (at least until very recently). The gap was largest for the high school class of 2009. The proportion of that class possessing the reading skills for college-level work was a whopping thirty-two percentage points less than the proportion that enrolled. Late last year, the National Student Clearinghouse published the disappointing news that college completion rates are trending downward, and that just 53 percent of the students who started higher education in 2009 had earned degrees six years later. Now look at the chart again. Is this any surprise? To put it bluntly, much of the high school class of 2009 failed to complete college because far too many of its members weren’t prepared for college in the first place. But are higher education leaders willing to say this? Not as far as I can tell. A brand-new report from the Center for Community College Student Engagement looks at “the underprepared student and community colleges.” (It led to another not-so-shocking headline from the Hechinger Report—at least not shocking to us jaded K–12 policy wonks: “Why are many students with ‘A’ averages being barred from college-level classes?” Answer: Because of rampant grade inflation in high schools.) It’s full of depressing statistics (86 percent of community college students think they are well prepared academically, yet 68 percent land in remedial education) but also worthy ideas about how to provide “underprepared” students greater support and better advice. But not once does it contemplate the obvious, if politically incorrect, solution. Namely: Stop admitting students who are far from ready to succeed in college. Why do we consider for-profit colleges “predatory” when they recruit ill-prepared students but allow community colleges and state universities to engage in the same practice while hiding behind “open access” rhetoric? We know many students are unlikely to ever make it past developmental education, much less earn credentials. (A recent study provides further evidence of this.) Why saddle them with debt and regret? Why allow colleges to cash checks from Pell Grants that aren’t going to do the students, or taxpayers, any good? There’s always been a big gap between the skills needed to earn a high school diploma and those needed to succeed in college. Neither Common Core nor anything else on the K–12 reform agenda is going to change that basic calculus. Policy makers simply will not deny diplomas to the huge portion of eighteen-year-olds who have made it to the end of the twelfth grade without the reading and math skills necessary to succeed in credit-bearing college courses. If the higher education system wants to improve its completion rate, and better serve young people coming out of high school, it should take it upon itself to set and enforce a real standard for college entrance—a standard much higher than a high school diploma. That this notion is still considered politically incorrect is one sign of just how unserious the talk of higher education “reform” really is.